Most Supplement Outfits Are Taught To Sell Toxic-Garbage. In 2010, I owned and operated a franchise nutrition store. The selections to choose from were vast and would confuse almost anyone. My opinion is that these stores survive from a few key products that yield the highest profit margins. Unfortunately, if a sick person walks in… Like I did many times in my journey to recovery… The person behind the counter has been trained to sell a highly profitable product, convincing you that this is the highest quality and logical choice. Needless to say, I became fed-up with owning a nutrition store with enormous overhead expenses that relied upon the sales of inferior products to meet the monthly bills. We stocked the superior brands, and a few people were convinced to upgrade and experience the benefits – yet the million-dollar challenge was in providing an affordable product that contained maximum quality. Not many of these products exist today. My retail business did not do well financially as I was too conflicted to sell the “cheap” marked-up crap, and I would often lose the sale all-together by trying to convince a customer of the value of paying more for a higher quality supplement. My discovery led me to believe that most people had too much on their plate, are used to not getting any benefit from their supplements, and are too afraid of investing in their well-being due to being burned so many times by empty promises, hype, and inferior (toxic) products. It was a scary proposition to part with their hard-earned dollars for expensive alternatives that may have been beneficial and produced results. Most supplements are being created for profit, hype, and not feasible for producing any real benefit to the body. The industry is vastly unregulated; raw ingredients are then sourced dirt cheap from China (sometimes tainted with toxic substances), and products retail for 1000’s of times the original cost of manufacturing them. The bottom line is that formulating a pure and effective nutritional supplement is no simple task. The task is extremely complex and requires a huge amount of knowledge and consideration to details, not to mention costs involved. A 75% Chance That Your Multi-Vitamin is A Toxic Poison Masquerading As A Health Supplement…? Over half of ALL vitamin products do not even dissolve on time to be of any use to the body. A study that was published in the Journal of the American Nutraceutical Association found that only around 25 out of 100 supplement products are both effective and nontoxic. Not only are most supplements a waste of money, they are a poison to the body. Enough is enough. Enter the “Gold Standard” whole food based nutraceutical solution … Bringing forth the highest value at the best price, not to mention the tough taste-appeal required by most children! Did I mention the fact that it’s a liquid Ionic-formula with near-100% absorption and is easy to stomach and digest? I’ll get to that in a moment. 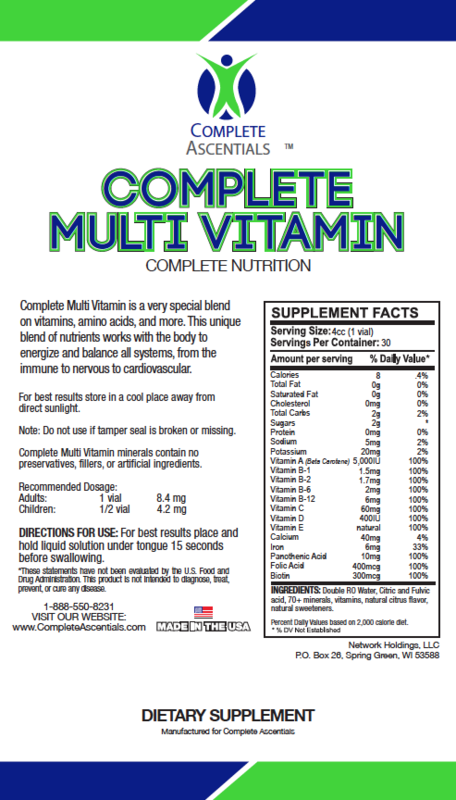 Complete Ascentials™ Beyond Whole Food Multi-Vitamin Is Our “Gold-Standard” Formulation For Covering The U.S. RDA Requirements Of Children and Adults… in A Tasteful and Simple Way. Complete Ascentials™ Beyond Whole Food Multi-Vitamin is a blend of whole foods, cherry juice, and honey, in a base of certified aloe vera juice. This leading-edge Multi-Vitamin is designed to provide your body with the vitamins, trace minerals, amino acids, minerals, and enzymes required to meet all your daily RDA requirements in a safe, nontoxic, and supremely absorbable way – nearly 100% absorbable and it tastes pleasantly delicious! Complete Ascentials™ Beyond Whole Food Multi-Vitamin also includes AsentialFulvic™ — clinically-tested, CHD Fulvic-Acid in a base of water energized with 6 Ancient Solfeggio Tones, including the 528Hz (called the ‘LOVE’ frequency by Dr. Len Horowitz) frequency being used by biochemists to study for its potential with DNA repair. Whole foods from 10 species of seaweed and sea vegetables (nature’s perfect food) providing a variety of potential health benefits including anti-oxidant and nutrient-rich compounds. Clinically-tested CHD Fulvic-Acid enhances the absorption of nutrients, and has anti-viral, anti-inflammatory, anti-bacterial properties. Aloe Vera juice providing a vast array of digestive enzymes that assist the body in assimilating nutrients. Honey provides B-complex vitamins and has energizing properties. Wild cherries provide a pleasing flavor and a plethora of anti-oxidants. Eleuthero provides an energy boost without the downside-‘crash’ often occurring with Caffeine use. 6 Ancient Solfeggio tones energized into the water for a potential added value, including the 528Hz ‘LOVE’ frequency – as outlined by Dr. Len Horowitz in his book, The Healing Codes For the Biological Apocalypse. A World-Class Formulation – The Only Thing Better Than its Quality Is Its Affordable Price. The ultimate satisfaction I have in offering Complete Ascentials™ Beyond Whole Food Multi-Vitamin is its SUPERIORITY and AFFORDABLE-PRICE! The riddle of producing a world-class, effective in delivering top-quality nutrients, and cGMP certified “nontoxic” solution for children and adults to benefit from, has been solved. Enjoy this product as a stand-alone solution to meet 100% of your daily RDA requirements, or combine it with a Complete Ascentials™ Kit for maximum potential benefits. To experience maximum benefit from Complete Ascentials™ Magnesium, also consider adding our ‘Ascential Kit’. RNA influences DNA and our Complete Ascentials DNA Evolve and RNA Spray may assist the body in supporting human potential at the cellular level with Holoresonant, Pharmaceutical-Grade, M-State Advanced Minerals in a Pharmaceutical-Grade Custom Probiotic Matrix that is unlike any nutraceutical out there. We take our quality and research and development seriously, bringing forth what we believe to be the highest standard in product-excellence when it comes to supporting Human Potential and Well-Being. Experience Complete Ascentials DNA Evolve with RNA Spray and feel the difference!